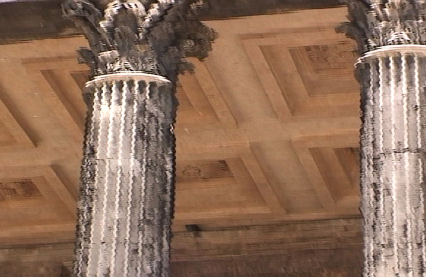 Standing in the heart of Nîmes, in what was once the Forum, the Maison Carrée survives intact, probably the best-preserved Roman temple anywhere. 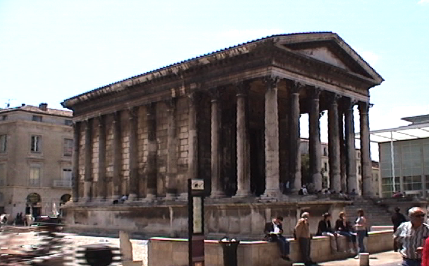 Also built by Agrippa (see the Pont du Gard above), between 19 and 12 B.C.E., the temple was dedicated to his two sons, who died at very young ages. 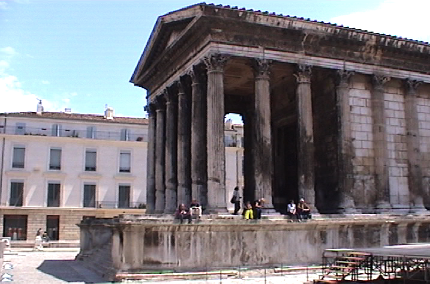 Typical with Roman monumental works, the temple sits on a podium (platform) nearly 3 meters high (10'). 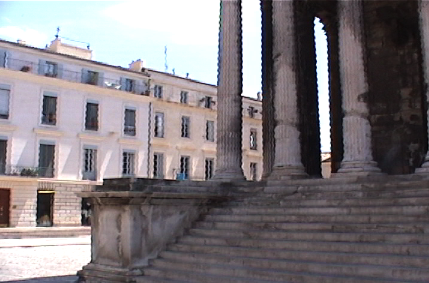 The Corinthian column ratio is 6 on the short entrance side, and 11 on the longer side. Another Roman feature here is the expanse of stairs in front (the north side), set between projecting sidewalls of the podium. Both the podium and this stair configuration are Roman innovations, but the design and its details are close to the Greek. Extra credit if you can find out if there was a god associated with this temple. Some sources describe it as a "civic temple". 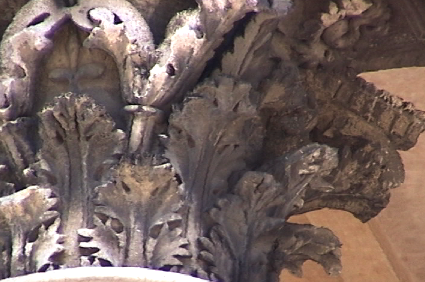 Here we have the Corinthian columns, and a detail of one capital, with representation of acanthus leaves. The actual leaves in nature are rather feathery, and have been so interpreted. 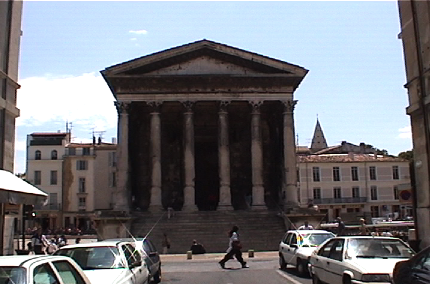 Thomas Jefferson, in France while Ambassador to that country, wound up in Nîmes, and he apparently said that he gazed upon it: “whole hours…like a lover at his mistress.” As mentioned previously, Jefferson modeled his Richmond, Virginia Capitol directly on this Roman temple. Compare the two on your own. 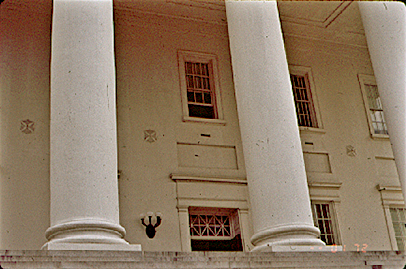 Here, for your comparison, are four views of Jefferson’s Capitol building in Richmond. Only differences being that Jefferson needed two floor levels, and that destroyed the original concept of a single space inside Nîmes, and rather messed up the exterior views. And, interestingly, Jefferson changed the Order - went from Corinthian to Ionic; might have feared a plagiarism suit otherwise. Glibness aside, Jefferson supposedly did this to ease the work of the sculptors. But, in all fairness to Jefferson, the spirit of the times, the end of the 18th century (1785-1789) architecturally, was decidedly Neo-Classical. With no formal architectural training, Jefferson managed to become part of the Classic Revival movement, which went back to Roman origins, with a touch of the Greek. This movement came about as a reaction against the so-called distortions of the Baroque and Rococo. 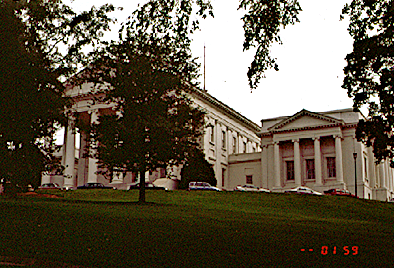 The Capitol in Richmond has been declared to be the first truly Neo-Classic monument in the United States. 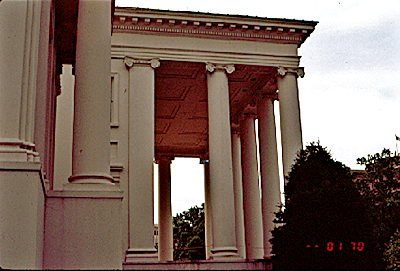 Going back to the “roots” of Western Architecture, Jefferson was also declaring independence from British architectural tradition, vis-a-vis the Georgian Style which had become dominant in this country. Further, the Richmond building has been described as the first American building to employ the Roman Temple form in a practical way, adapting traditional forms to contemporary needs, using form instead of pasting on details. All of this is fine, but the distortions of the second level do destroy the side elevations. 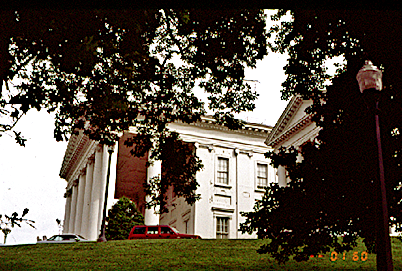 The term “American Classic Revival” has been used by historians to describe Jefferson's Capitol. More on Jefferson, particularly his campus plan for the University of Virginia, in our second semester of Western Architectural History.